On July 18, the Board of Regents, State of Iowa, approved a $250 increase in tuition for resident undergraduate students for the fall of 2016. This is $50 less than the proposal from the University of Iowa and the first increase for resident undergraduate students at the UI in three years. Undergraduate resident base tuition and fees for the 2016–17 academic year will be $8,575, though total costs will depend partly on the student’s major. The UI remains one of the most affordable options for students, with the second-lowest undergraduate tuition in the Big Ten—more than $3,000 less than the average 2015–16 Big Ten tuition, which was $12,000. These increases are in addition to the $200 increase for resident undergraduates for the fall of 2016 that the Board of Regents approved in December 2015. Harreld says that, indexed for inflation, the UI spends about the same amount per student as it did 20 years ago. About two-thirds of the UI’s general fund revenue comes from tuition (62.5 percent), whereas state appropriations cover slightly less than one-third (31.5 percent). Fifteen years ago, these figures were reversed, and state appropriations covered two thirds of revenue: In fiscal year 2001, state appropriations accounted for 63.7 percent of general education funding at Iowa’s public universities, with tuition accounting for 30.6 percent. This graph shows what percentage of Iowa’s public university general education funds is covered by state appropriations, tuition, and other sources. 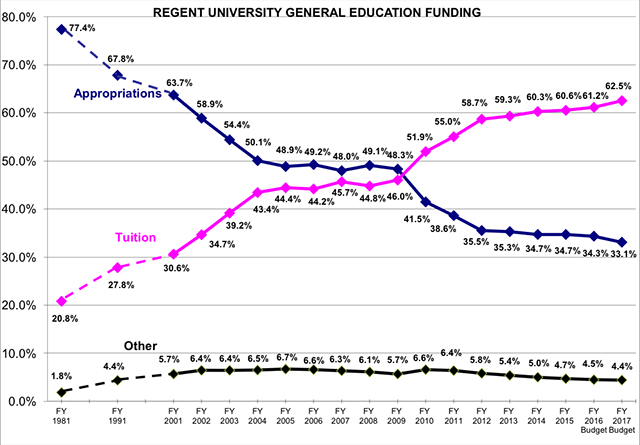 State appropriations have declined, and tuition has increased proportionately. Image courtesy of Board of Regents, State of Iowa. The UI requested a $4.5 million increase in state funding for fiscal year 2017, but due to budgeting constraints, the Iowa General Assembly voted in April to appropriate only $1.3 million.